Aloha, I'm a husband, father, jack of all trades, coach of all sports and owner/manager of 5 vacation rentals in Hawaii. I was raised in Hawaii from the age of 8 years old after my family moved here from the USA mainland. Hawaii has so much to offer and I hope you get the chance to visit and explore this amazing state. We love it in Volcano. You can experience 11 of the 14 climates in Volcano. The ever-changing historical beauty of the Volcano National Park is amazing. The small town feeling and tight community in Volcano is familiar since I grew up in a small town on Oahu. I enjoy the cooler temperatures at the higher elevation in Volcano. It can be over 90 degrees with 100% humidity on Oahu but in Volcano it will be a cool 75 degrees with very little humidity. And at night, the temperature cools down and reminds me of my college days on the mainland. My family really enjoys the volcanic changes that go on at the Volcano National Park. With the park being only one mile away, it's easy to take a drive after dinner through the park to see the glow of the lava. And every time we visit, we go to the Sunday Farmers Market in Volcano Village. Towels, Shampoo, Bar Soap and Toilet Paper are included. No big box stores here. All 'mom & pop' restaurants, shops & stores. You'll have to drive 30 mins. to Hilo for the city life. Volcano Village is a 10 minute walk away. Not really a mountain view because your on top of it all. With all the tall ohia trees and tall ferns it's more of a beautiful forest view. Radiant wall heaters are available for those really cold nights but the wood stove can generally heat the entire house. Linens are a comfortable high thread count, not cheap scratchy sheets. Enough for all beds, trundles and futons. There are beach towels too. Stainless Steel HE Front Loading Washer. Detergent is provided. Stainless Steel Gas Dryer . Dryer sheets are provided. It's a wood stove actually. Kitchen, Beach & Bath towels are provided. ...use the high-speed wireless internet access. Both are free. 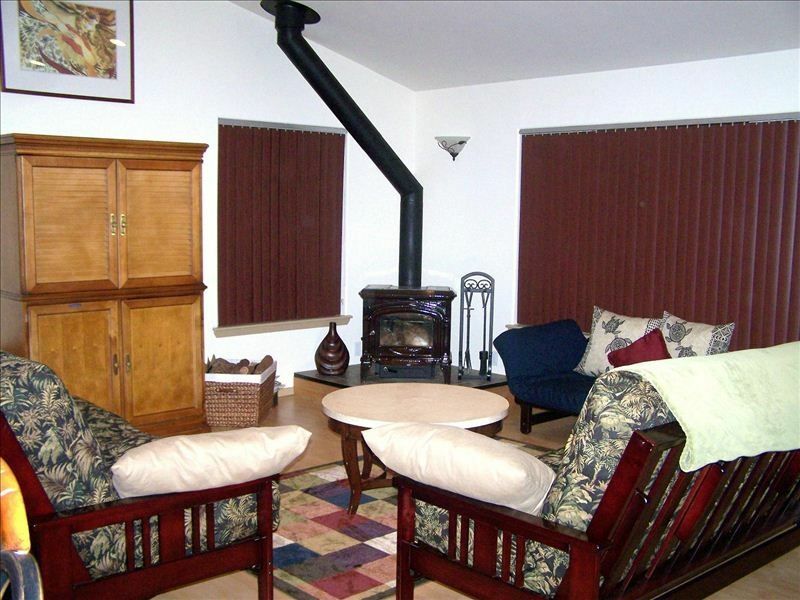 Keeps the entire home toasty warm on cool nights with the wood stove in the living room. Full Kitchen: Stainless Steel Stovetop and Oven is gas, Stainless Steel Fridge and Dishwasher, Eating Bar at the Kitchen Peninsula has 5 Bar Chairs. 40' Sony HD LCD TV with HD Cable and Surround Sound. There is a DVD Library in the entertainment center. Volcano Golf & Country Club is 5 minutes away. Very clean and felt very safe in the area. Overall very convenient to HVNP. Enjoyed our stay. Well stocked kitchen for cooking. Only down side was I never got instructions or directions before our stay. So I needed to ask the owner for this information. This is unlike my other experiences with Home Away. Mahalo for the review Diane and I'm glad you enjoyed your stay. As was mentioned once you booked your reservation and again, a week prior to your arrival,..."Within the week prior to your check-in, you'll be able to view the rental info, instructions & directions from the airport by logging into your VRBO/Homeaway account." I don't know when the last time you used VRBO/Homeaway was but with the current ability to put all of the documentation that my guest need online makes it available to them while they are anywhere in the world via a computer, tablet or smartphone. Very clean and comfortable home in the forest. The perfect location for easy access to Volcano National Park and Volcano Village. Thank you so much for allowing us to bring our dog. I'm glad you liked the house. The bed is a queen size in the master bedroom. Yes definitely. I'd be glad to honor a discount next time as I mentioned when you checked out. There was a cracked pipe fitting that was leaking so the house water pump was not turning off. So sorry you had to turn off the pump when not using it to stop the humming when the pump is on. All fixed now. The home and property where very comfortable, clean and well furnished. The two bathrooms, were adequate for 10 of us, 6 adults, 4 kids. Master bedroom and bath very comfortable, but there is a water pump and tank outside the exterior of the bathroom wall which is extremely noisy, especially if you go to bed early, it may be the only water pump into the entire house. We only stayed one night and the cost as listed on the VRBO site was $225.00 per night, but the managing agent fee was $244.00, with a cleaning fee of $100.00 and taxes raised the one night stay to $576.00, for 2 family's, which is okay, but for one family it would be very pricey for one night. Short drive to all, Volcano Nat'l Park and lunch at the Ohelo Cafe, very good home cooking and soups, fish sandwich was incredible. Ate Dinner at the Lava Rock Cafe, very good also, great grass fed burger, and salads. All food prepared at both restaurants are fresh, nice to get away from the processed stuff on the mainland, thought it may seem pricey to some, remember this is not the processed stuff on the mainland but real food on an island. Mahalo for your review and for bringing the cost plus the sound of the house water pump to my attention. Although I can't do much with the fixed costs including state taxes, cleaning & VRBO's fees, I can make an improvement to the exterior pump/heater shed so the sound of the pump is not as loud in the house. Aloha! Cancellation Policy-A full refund is given (less a $250 cancellation fee and the VRBO fees) if cancelled with more than 60 days before check-in. If cancelled with 60 days or less before check-in, a refund (less a $250 cancellation fee and the VRBO fees) is only given for those days I can re-book with other guests. Any changes to an existing reservation is subject to a $50 Change Fee (i.e. changing to fewer dates, changing to fewer guests, adding a pet, etc. ).